It’s the question I want to know. Is my rabbit pregnant? Waiting for baby bunnies shouldn’t feel like forever, but sometimes it feels that way. I bred my rabbits last month, and I was eagerly awaiting babies, but they never came. I re-bred both does and am eagerly awaiting bunny cuteness again, hopefully with better results. 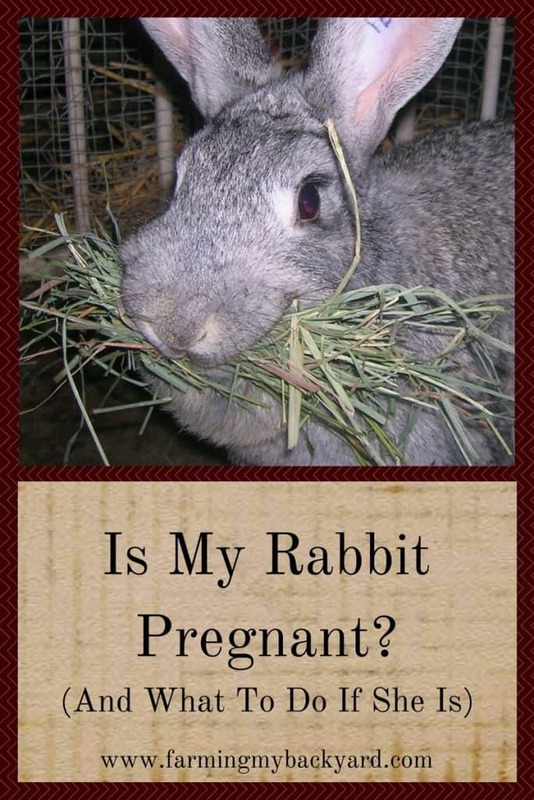 If you are like me, here are some indications that your rabbit may indeed be pregnant. This really doesn’t tell you much, but if she’s moody and grouchy, it very well could be that she is pregnant. (This never works for me. My does seem permanently cranky. The bucks are the sweetest things ever, but my does don’t like me no matter how many treats I bring). Around days 10-12 after being bred you should be able to feel small marble sized bumps along the sides of your does tummy if she is indeed pregnant. I’ve successfully done this once so far, so I’m not the best teacher. They’re Not Our Goats has as video of how to do it. So go watch that, and then go gently practice on your does. Gently. Because you don’t want to hurt her, and you don’t want your does to hate you as much as mine hate me. Sometimes rabbits have a false pregnancy, where they act like they are pregnant, but they really aren’t. Many won’t be receptive to the buck even if it’s a false pregnancy until after day 17. If your rabbit is nesting and it’s 17 days after her last breeding RE-BREED! She’s not pregnant. You can test breed all of your does on day 18 just in case, which I haven’t tried. Some breeders do this as a matter of course, and others avoid it for fear of causing a miscarriage if she is pregnant. Also, rabbits have two horns to their uterus so it is possible that she could be pregnant on one side, and then become pregnant on the other side after the test breeding. If it’s after day 21 and your rabbit is nesting, she’s probably pregnant. Yay! She might be pulling tons and tons of fur to line the nest, or running around with a mouthful of hay. You can give her a nest that early, but make sure to clean it out if she poops in it. My does are good at pooping in their nest boxes. Make sure to give her a nest box by day 28 even if she’s not pulling fur. (Here’s how to make a basic nest box). That’s the indication I can always count on. Although, if it’s day 30 and there are no babies don’t despair, sometimes rabbits can go a few days longer. I had one doe that always had her babies on day 32. I’ve read that some rabbits may take as long as 35 days, so if no babies by day 36 RE-BREED! Once your doe does have babies, check the nest and remove any dead ones. She won’t neglect the litter even if you take a look around. Make sure they really are dead first, and not just overly chilled. You can sometimes warm them up. If she didn’t pull enough fur, add some more. (You can save some from those false pregnancies, or if you have a doe that pulls a lot). If you are particularly worried about a litter you can bring them inside. Rabbits nurse their young at dawn and at dusk, so you can bring the nest box out at those two times and usually the doe will hop right in to feed the babies. I had to do this after rats infiltrated our rabbit colony until I got the rabbits moved into hutches. (Sadness. The colony still isn’t rat proofed, so the buns are in hutches until I remake it. Although they seem perfectly happy, and even get excited to get back to their space when I bring them inside when it’s hot). Usually the mothers will take care of just about everything, but there are a few things you need to do for baby bunnies. So the burning question we all want to know. Is my rabbit pregnant? Maybe. Maybe not. There are some clues that may help you get an idea if it’s likely or not, but in the end, you’ll know for sure when the babies are actually here. If you want more resources and information on raising rabbits, check out our resource page! I’ve contemplated getting rabbits again. I raised and bred rabbits for 4-H, 20 years ago. Gotta love them bunnies 🙂 Thanks for the tips! They are fun. 🙂 You’re welcome! I think one of my bunnies is having a false pregnancy. I sure hope it isn’t real though. It would have been a mishap. But I don’t know how should would have come in that close of contact with my male rabbit. Because she has been grumpy for about a month, now she’s building her nest with her fur and everything. I’m curious and I want to try to check her for bumps if I can without her biting me. Rabbits will also pull fur when they WANT to be bred, so that could be one explanation if she hasn’t been in contact with a buck. so, if my bunny is nesting AFTER day 21 she is probably not pregnant? or if she is nesting BEFORE day 21, she is probably not pregnant? If she’s nesting at any time other than around day 28-31 she’s probably not pregnant. Hooray! Some does just need an extra day or two for some reason. So I got a girl bunny a couple weeks ago and my male bunny that I had. They get a long very well. I kept him in the cage with her. I don’t know if I should take him out or not. I haven’t checked her tummy for the little marbels to see if she is pregnant but he tries to get her all the time. She doesn’t like me holding her and he always protects her when I’m trying to pet her. If they are in a cage together you should take him out. If there isn’t a place for the female to hide or enough space for both of them she could castrate the male. Chances are she is pregnant if she’s been with the male. Give her a nest box 28 days after she was first put with him, and keep it in there until 32 or so days after you separate the two of them just in case. If you want to keep them together you may want to look into setting up a colony and adding one or two more females so that your boy isn’t always trying to get at your female. Before my rabbits have for sure hit breeding age they were caged together, I was planning on using my younglings for breeding but even female I put in with the bucks gets very angry (growls,thumps, runs away*not playfully*) I have no idea if they are pregnant and that’s why they refuse breeding or what’s up? They have became moody a lot lately and I can’t tell if it’s pregnacy or not. If you haven’t seen the male successfully mount the female when you put them together they probably are not pregnant. If they were housed with the male for a while it’s a good idea to put a nest box in with them just in case up to 30 days after they were separated. cage) please tell if pregnant.